She carefully inspects the thickness of the pastry that encases the succulent chicken filling. A cross between a samosa and a gujia, the Kozhi Ada is a Moplah specialty that is actually served as a tea time snack. She laughs when I ask her about the equally enticing Ulliyada which has a caramelized onion filling. ‘Moplah cuisine is not high on vegetarian delicacies’ she says smiling, but she improvised to please the vegetarian guests. She signals to the ITC staff that the Ada is up to the mark and then settles down to regale us with tales from Moplah land. After two hours of abject gluttony and childhood stories, I’m floored by this 80-year-old diminutive food adventurer called Ummi Abdulla. 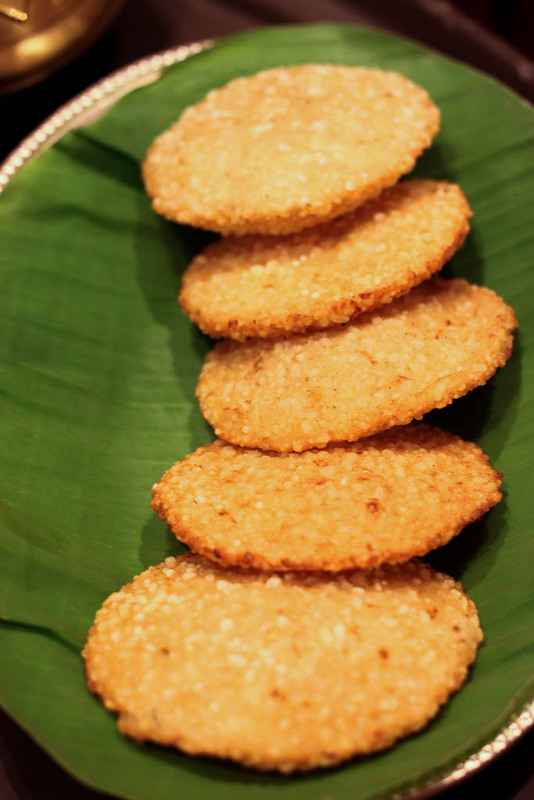 Her first love – traditional Moplah cuisine, is being showcased by Dakshin, ITC Windsor till the 12th of September. Right off the bat, let’s just say you need to experience it! The Moplah community has its origins centuries ago, when Arab spice traders settled on the Kerala coast and married the local women. The current community of Malayalam-Muslims has a unique cuisine that ties in Yemeni and Kerala flavors. A cuisine that adores bananas, rice, fennel and eggs in any form (including desserts) and has a penchant for more meat than veggies, employs sophisticated cooking techniques that can put a French chef to shame! Ummi is like the Matriarch of Mopla food and her many cookbooks, TV shows and culinary tours stand testament to her mastery over the cuisine – but it her own love for it that propels her to keep refining her recipes. If that means engaging her family and friends to test her recipes – so be it! We had one of her ‘testers’ – her lovely granddaughter Nazaneen, join us for dinner as well and tell us how she tested the wondrous and frankly confounding, Panchara Patta – a dessert of deep fried bubbles! Rice flour and eggs are whisked till the froth rises to the surface. This froth is fried by layering it one ladle at a time in hot oil till you reach a honeycomb like structure. The structure is then removed and drained for two days before it is free from all the oil. It is finally crumbled and eaten with sugar and bananas! (Nazaneen and Ummi are working on a new Moplah cookbook with gorgeous photos – so keep a look out for that beauty). The ITC Dakshin team with Chef George under her tutelage, have unfolded a beautiful menu of Moplah favourites for the festival. 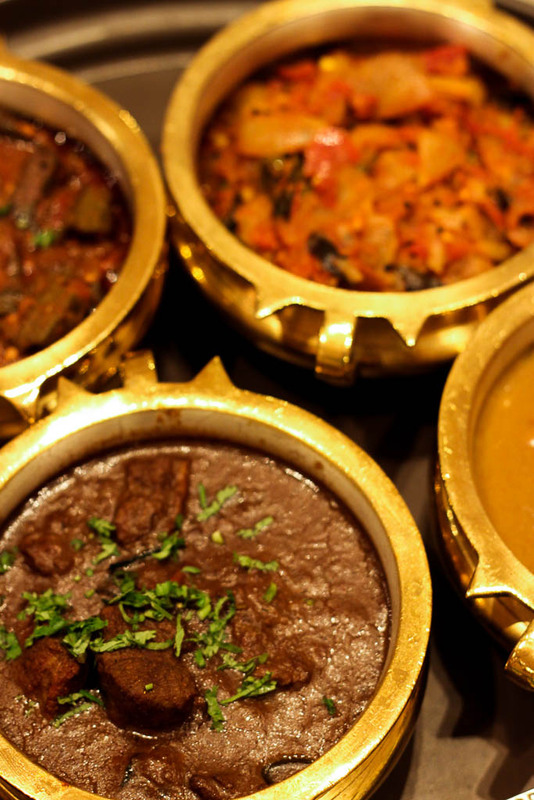 It would be wise to opt for the curated Thali to experience the whole nine yards. But if you insist on trying individual dishes, here are my favorites. Chemeen Unda: I know it’s close to Ganesh Chathurti and maybe modak’s are on my mind, but the Chemeen Unda wins for much more than being a dumpling. 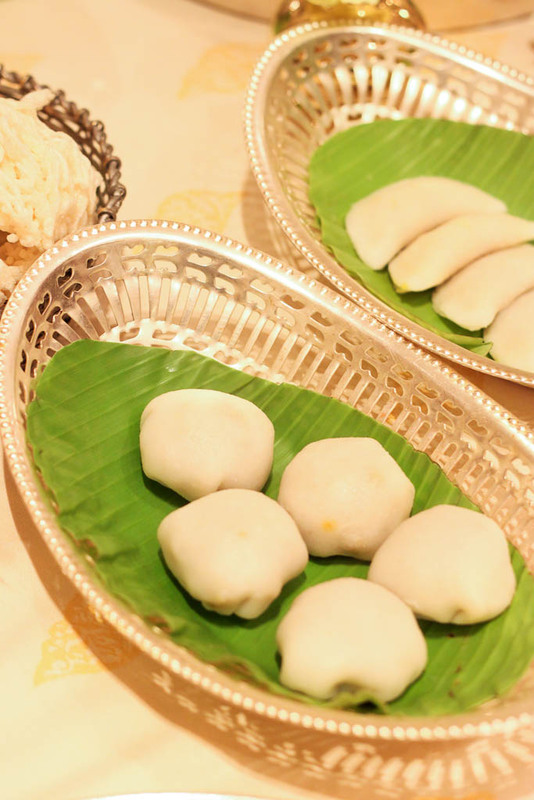 The soft and plump rice dumpling is stuffed with spiced minced prawns! If it wasn’t forbidden to eat meat for this festival, I would have rolled a couple of these out. 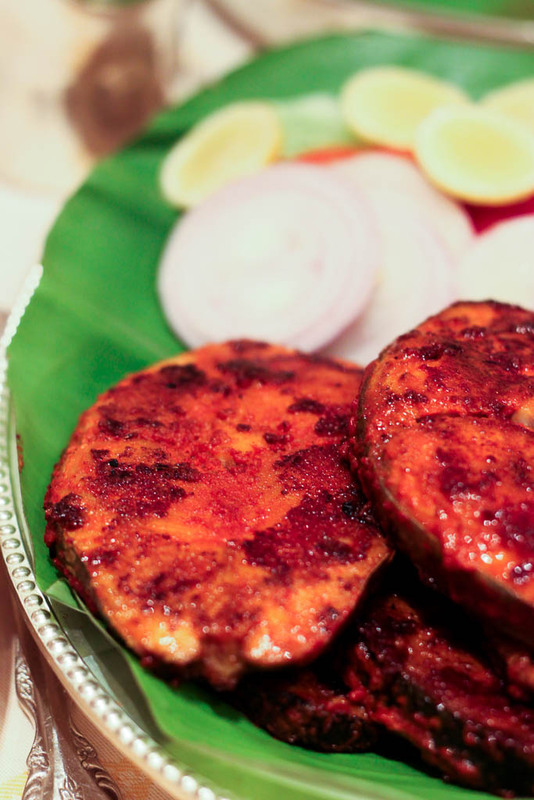 Meen Porichadu: Large Seer fish steaks marinated with Malabar spices and deep fried to perfection. This one needs nothing but a moment of silence, to enjoy the fish in peace. Takkali Vattichathu: It’s preposterous to rave about a simple Tomato stir fry, but it really was that good. The plump tomatoes are cooked with fresh coconut and fennel, resulting in a light and flavourful main course. Mutton Varatharacha Curry: I’ve always been partial to curries that use coconut. This one is of typical Malabari style, where the mixture is fried till it reaches a deep brown colour that intensifies the sweet flavor of both the coconut and the onion. The succulent mutton pieces soak in this heady curry and it is best relished with the Mopla Neichor – luxurious Ghee Rice. Ney Pathiri: Ney means oil and Pathiri means bread. This is a deep fried leavened rice bread flavoured with shallots and cumin. It looks like a textured Poori with bits of half broken rice forming the puffy outer layer and the more delicate ground rice forms the inner layer. The next three dishes form the traditional mainstays of Mopla weddings and I’m completely convinced that people went to weddings just to eat this! Alisa: A refined and lighter version of the popular Haleem, the preparation is reserved for special occasions like marriages where it is served first. 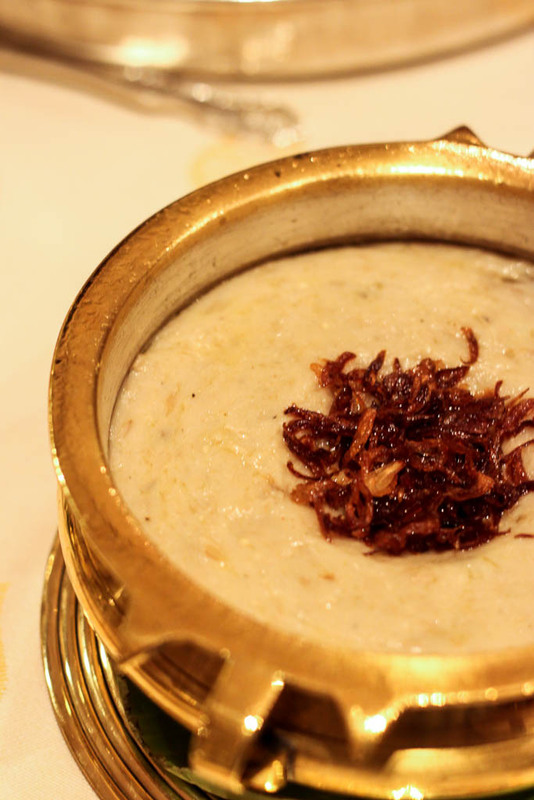 A husked wheat and mutton porridge, it is lightly spiced and garnished with fried onion slivers. Ghee and sugar (yes, a dusting does wonders) are also integral to the dish and are served as add-ons according to one’s taste. 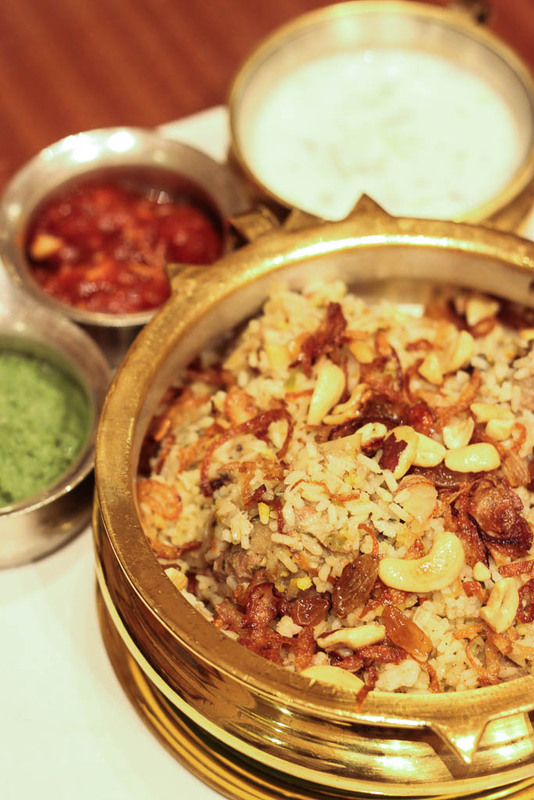 Thalasseri Mutton Biryani: What is a wedding without Biryani right? This one however is so delicate that you won’t be groaning full once you’re done. The steamed rice is layered with spiced mutton and caramelized onions and served with a coconut chutney, green chilli chutney and raita. Pretty hard to beat. 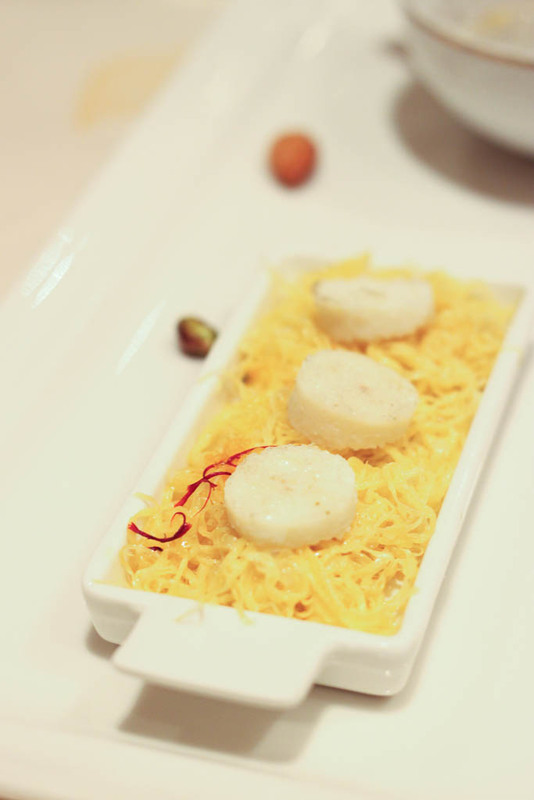 Mutta Mala: An eggy dessert. The entire dessert is made of eggs! The noodle like saffron flavoured element is made of egg yolk fried in hot sugar syrup and the little banana slices on top are actually egg white roundels flavoured with elaichi. Heston Blumenthal style molecular gastronomy was alive and thriving with the Moplas! This one is a must have – for the technique and the fact that it messes with your mind and palate. At the end of the fabulous meal as I licked the Mutta Mala plate clean, I asked Ummi what her favourite dessert is – Mutta Mala or Panchara Patta? She said she likes the simple stuff that her grandmother used to make. Like the Kaya Ada which has bananas, jaggary and rice flour paste steamed in a banana leaf cone. Simple and sophisticated – just like the lady herself. 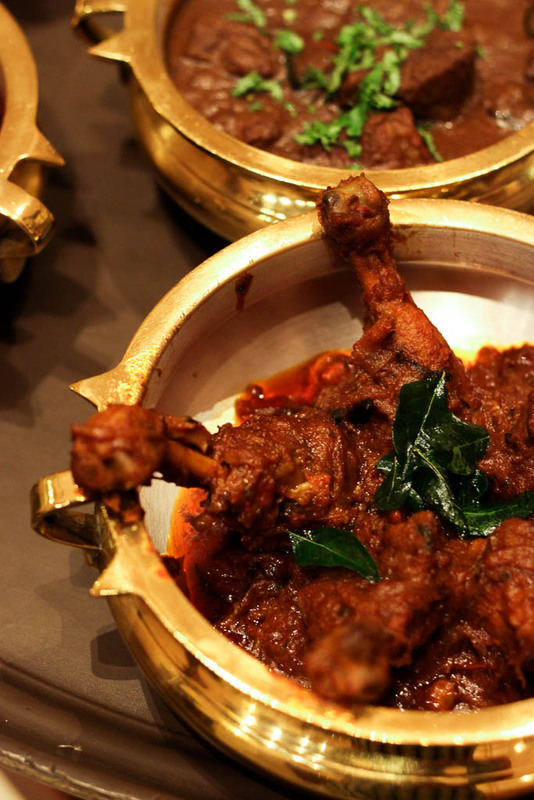 The Mopla festival is on for lunch and dinner at the Dakshin, ITC Windsor till the 12th of September. The thali is priced at INR 2300/++, they also have an extensive a la carte festival menu. 25 Golf Course Road, Bangalore – 560052. Previous Post15 minute Tiramisu – for real!